Refrigeration had already destroyed the ice making business in America by the time Mexico began getting with the program. Even still, becoming Magdalena’s ice delivery man was by far the biggest break in Nabor’s life up to that point. His salary would be as high as 200 pesos a day during the summer. It wouldn’t be that great during the winter months, but even then it was far better than working in the ice factory. Before he could start cooling down the alcoholic beverages of Magdalena, Nabor needed to buy a truck and there was no way he could pay for one on his own. 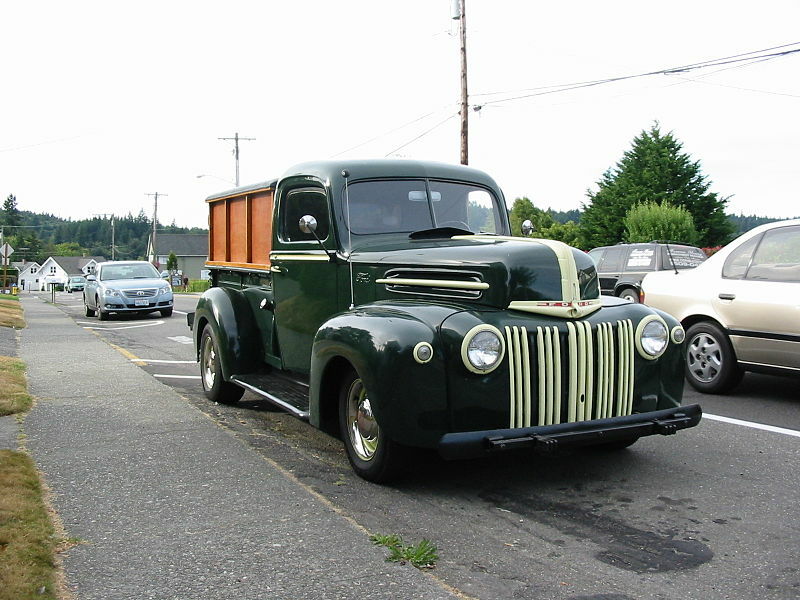 So he asked the ice factory owner to co-sign for a 1946 Ford 1/2 ton Pick-up that he had his eye on. The factory owner agreed and with a flash of his pen, Nabor began making payments on the 6,000 peso truck. Now all Nabor had to do was deliver the ice. Sounds easy enough, verdad? It wasn’t easy by any stretch of the imagination. Ice melts. And in the sweltering summers of Sonora it melts extremely fast. Which meant that young Nabor had to move that much faster with 50 lbs. blocks of ice in each hand. His day was divided into two shifts. The first shift was a non-stop, 6 hour marathon where he would get Magdalena’s bars and residences ice as fast as he possibly could. Fortunately, Magdalena’s roads were at least good enough so that the ice wouldn’t break as he hurried from stop to stop. Nabor only had enough time to grab the money from customers, count it quickly, and shove it in his pockets. Because of this he was walking around with a substantial amount of cash every day. This worried Nabor and so he purchased a small caliber pistol that he kept in the truck, just in case. By the end of his first shift he was soaking wet from the melting ice and from the sweat that was pouring out of him. So he would return home briefly to change, count the money, and eat. Then he would load up some more ice and do a few more deliveries. After a couple more hours, Nabor would be done for the day. It was hard work, but Grandpa Next Door never shied away from hard work. This was actually not his first time as a delivery man either. He had also driven a delivery truck a few years back…in America. It was the year of our Lord, 1950, back when he was making the ice and not delivering it, that Nabor decided to visit Los Estados Unidos. “Estamos Hundidos,” Grandpa Next Door said. “What’s that mean?” his pocho grandson said. He’s still a witty one that Grandpa. He surprised me when he mentioned that he had visited the US as early as 1950. I always thought that he started working there in the 60’s. That’s what happens when you ask; you get the real story. Nabor’s brothers, Ramon and Ismael had moved to Colonia, a community of migrant workers in Oxnard, in the late 1940’s. Oxnard is a Southern California city that sits in the midst of lush strawberry fields. To the east is Los Angeles. To the south is the Pacific Ocean. And to the northwest is Santa Barbara. Since work was so bad and money was so tight, Nabor wrote to his brothers about living with them in America, working for a few months, and returning home. He would also ask about La Migra (the illegal immigration agency) and how he might avoid them. Nabor got a temporary visa which permitted him to work in Los Angeles. Since he had this he could legally get across the border all the way to LA, but he was supposed to stay there and not live or work in any other city. Nabor, of course, needed to get to Ventura County to where his brothers and his job were. With the intelligence he had gathered from his brothers letters, Grandpa Next Door was able to formulate a plan to slip past La Migra undetected. When he got into San Diego he would change into a suit and tie, buy an English newspaper, and catch a bus to LA. At several points of the bus ride, La Migra would check the passengers’ visas and green‒cards. Nabor would sit there and try not to look nervous as La Migra went to those unfortunate people who were wearing tattered, soiled clothes or who were carrying around way to much luggage for a temporary visa. Wherever they were discovered would be their last stop as La Migra would take them off the bus to LA and begin deporting them immediately. Nabor just sat there and pretended to understand the English articles on the long ride to LA and they never asked him for his visa. The main checkpoints seemed to be in San Ysidro, San Clemente, and then finally in LA. At every checkpoint, more and more illegal immigrants were being sent home, but they kept overlooking Nabor. Then in LA there was an even bigger sweep, but somehow Nabor squeaked through again. Now that he was in LA he just had to lay low until La Migra calmed down. After a few hours, when he felt the coast was clear, Nabor caught a bus to Ventura County to go and be with his brothers. Ismael had found work loading up and driving a truck for a lemon company so he got Nabor a job there as well. As usual, it was hard work, but Nabor was making way more money than he was as a human ice cube. He was also paid per box of lemons delivered which gave him even more incentive to work hard. All in all, Nabor was extremely happy to make some extra money for his family. He stayed for around six months before returning home to Magdalena. Nabor would not see America again for another decade. The thought to stay in America for an extended period of time never crossed his mind. For him the USA was merely a piggy-bank to break into from time to time when money was tight back home. After becoming Magdalena’s Ice-Man, he didn’t foresee a time when money would be tight ever again. But refrigeration had already destroyed the ice making business in America and it was beginning to do the same throughout Mexico.